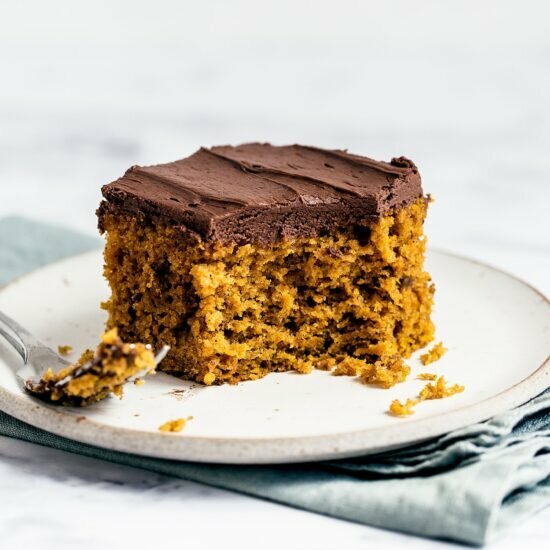 Easy Pumpkin Cake with Whipped Ganache features a super simple spiced pumpkin sour cream cake layer topped with creamy and light whipped chocolate ganache for a quick fall treat perfect for any party or craving! Taste: I love the sweet spiced pumpkin flavor coupled with the rich chocolate flavor of the ganache. 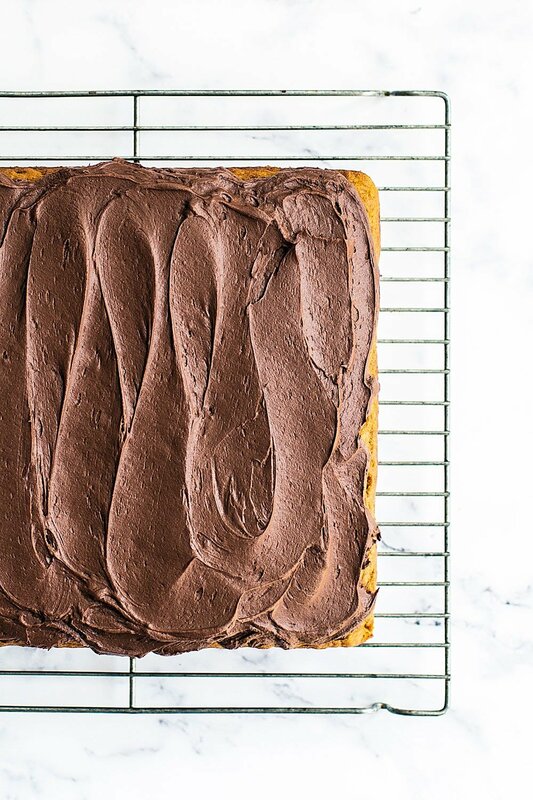 Texture: The cake is tall, moist, and tender while the ganache is somehow simultaneously light yet rich and beyond creamy. Ease: This is the best part of this recipe – it’s so quick and simple! It’s also easy to transport and serve. Pros: Easy and delightful fall treat. 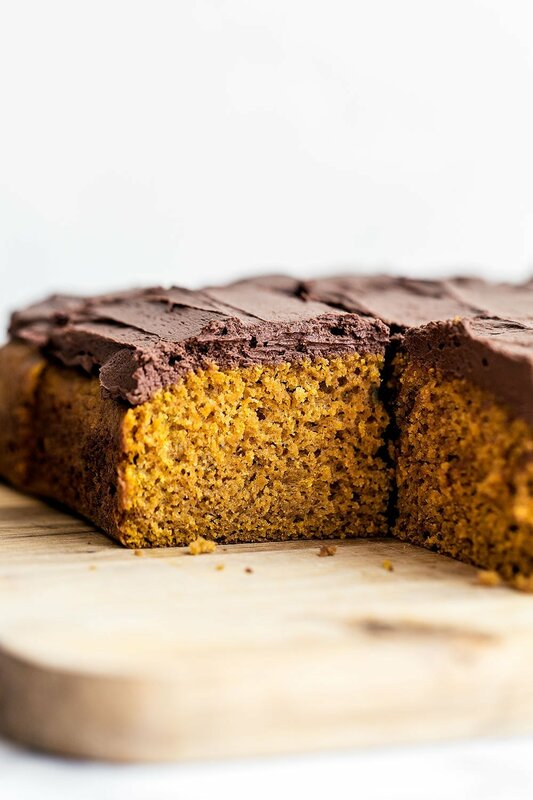 I don’t know about you but I just love the combination of pumpkin and chocolate. It’s definitely not as popular as other delightful combinations like pumpkin + caramel, pumpkin + cream (hello PSL), or pumpkin + brown butter. But I’m obsessed with pumpkin + chocolate all the same. This Easy Pumpkin Cake with Whipped Ganache recipe is one of those super simple crowd pleasers that’s perfect to keep in your back pocket for any fall potluck, party, or just when the craving hits. The cake itself is super simple and doesn’t even require an electric mixer. It gets its amazing flavor from lots of warm spices, tangy sour cream, and both white and brown sugar for good measure. The ganache is just two ingredients. 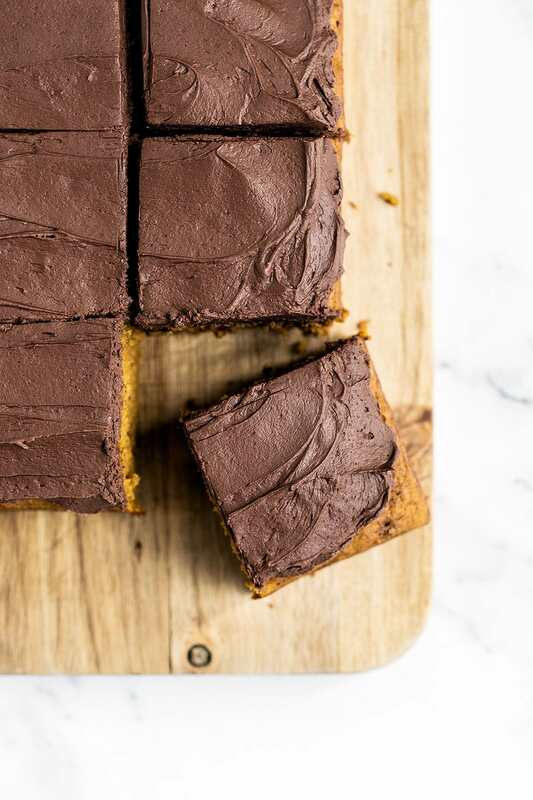 The hardest part is waiting for the chocolate cream mixture to cool before you can whip it up into a fluffy yet rich mousse-like texture that perfectly complements the moist cake. No sugary buttercream or cake decorating here! If you’re serving a larger group, you can definitely cut this cake into smaller bites. This recipe tastes particularly amazing with a cup of coffee or chai. You can easily double this recipe and bake in a 9 by 13-inch baking pan for about 5 minutes longer. Preheat oven to 350°F. Line an 8-inch square baking pan with parchment or foil, leaving an overhang. In a large bowl, stir together the flour, baking powder, baking soda, salt, cinnamon, nutmeg, ginger, cloves, and allspice. In a medium bowl, stir together the pumpkin puree, oil, sour cream, eggs, brown sugar, granulated sugar, and vanilla. Make a well in the center of the dry ingredients, then pour in the wet ingredients. Gently stir until just combined. Bake for 35 minutes, or until a toothpick inserted in the center comes out clean. Glass and ceramic pans may take longer to bake than metal. Cool. In a microwave-safe bowl, microwave the chocolate and cream in 30-second bursts, stirring between each burst, until smooth. Place in the fridge for 30 minutes, or until slightly firmed. Using an electric stand mixer fitted with the whisk attachment, beat the ganache until light and fluffy, about 3 to 4 minutes. Spread all over the cooled caked before serving. The cake can be covered and stored in the refrigerated for up to 2 days. 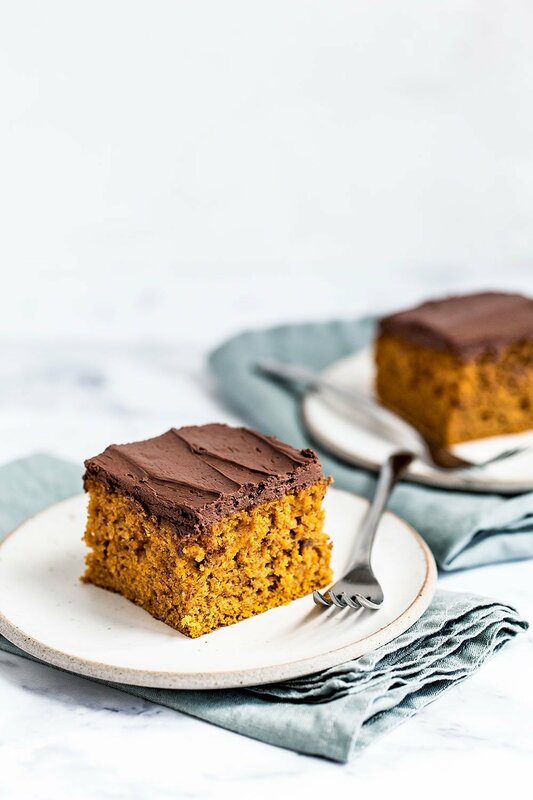 I keep seeing pumpkin + chocolate combinations – I’ve never actually given it a try, but it actually sounds amazing! This cake looks yummy, Tessa. I have a blend of pumpkin spices. Could I use that and about how much?